The first Valentine’s Day with a new significant other might seem like a lot of pressure. You want to get them a gift, but you don’t want to give them something too big or too small. The Valentine’s Day present for a new partner needs to be just right. We’ve compiled a couples first Valentine’s Day gift guide of items that are perfect for blooming relationships to help get that first romantic holiday off to the right start. One of the most classic Valentine’s Day gifts you can give to your new love is a bouquet of the most romantic flowers. Red roses convey love, desire, longing, devotion and admiration. When given to a romantic interest, they serve as a thoughtful expression of love. You might decide to go the whole nine yards, providing your love with two dozen roses. 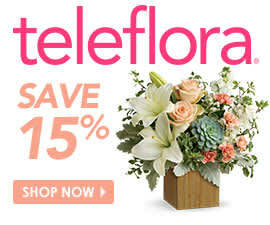 Teleflora’s Flawless Romance Bouquet is a classic yet luxurious arrangement that will have your partner’s heart racing. Or perhaps you’d rather go a more simple route; the Thoughts of You Bouquet with Red Roses is simple and sweet, with nine blooms presented in a glass vase that is accented with a delicate red bow. Whether you give them a half-dozen flowers or dozens and dozens of roses, make sure you present them with flowers in a romantic shade of red. If you know that your significant other is a fan of journaling, writing or sketching, you might decide to get them a high-quality notebook. A leather-bound notebook or sketchbook is a great gift idea for a first Valentine’s Day, as it is personalized but not over the top. What good is a new notebook without some nice pens? Your creative partner will think of you whenever they fill the pages with their poetry, illustrations or simple reflections on their days. Who knows – maybe you’ll be the source of inspiration for their next artistic project. As a somewhat newly dating couple, you and your significant other likely want to start making memories together. Use Valentine’s Day as an opportunity to give the gift of an experience. If they’ve been eyeing tickets for a certain performer who’s coming to town, surprise them with tickets to the show. Maybe your special someone is a die-hard basketball or hockey fan; in that case, surprise them with a set of tickets to a game and represent their favorite team together. Keep your eye on the schedules of concert venues and arenas in your area and prepare for a night you will never forget. On Valentine’s Day, you can’t go wrong with a gorgeous piece of jewelry or classic new watch. However, in the first year of a relationship, you won’t want to splurge too much. A classic sterling silver necklace or dainty set of gold earrings send the perfect message without coming in at too high of a price point. If you know what type of perfume or cologne your significant other uses, you might decide to pick up a new bottle of that scent for them. Maybe they’re interested in something new. In this case, go to a local department store and get ready to experience sensory overload as you peruse the dozens of sample scents for sale. Buying a signature scent isn’t easy; you should try to go into the store with a basic understanding of the types of smells they do and don’t like. Do they like floral scents? Or more musky smells? Once you’ve narrowed it down, the search will become much easier. You might have seen promotions for these fun wall decorations around the internet. These posters of world maps allow world travelers to scratch off areas they’ve been to. If you know that your significant other has dreams of traveling the world, this gift may be right up their alley. In addition to being an attractive poster for their home or apartment, these maps can inspire your partner to pursue new adventures. Maybe it will spark inspiration for your next couple trip.